Source: New York Aurora 9 April 1842: . Our transcription is based on a digital image of an original issue. Original issue held at the Paterson Free Public Library, Paterson, NJ. For a description of the editorial rationale behind our treatment of the journalism, see our statement of editorial policy. Cite this page: Whitman, Walt. "The Bloody Sixth!." 9 April 1842. The Walt Whitman Archive. Gen. ed. Ed Folsom and Kenneth M. Price. Accessed 18 April 2019. <http://www.whitmanarchive.org>. 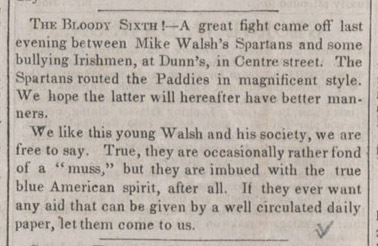 A great fight came off last evening between Mike Walsh's Spartans1 and some bullying Irishmen, at Dunn's, in Centre street.2 The Spartans routed the Paddies in magnificent style. We hope the latter will hereafter have better manners. We like this young Walsh and his society, we are free to say. True, they are occasionally rather fond of a "muss," but they are imbued with the true blue American spirit, after all. If they ever want any aid that can be given by a well circulated daily paper, let them come to us.